When researching family history, genealogists go to great lengths to find newspaper articles, records, photographs, and other items to document their family. The records provide fascinating information that provides bits and pieces to create a family narrative. Finding names, places, dates, and details from records takes methodical research and analysis. The excavating and analysis of scraps of information can also be seen as ancestral archaeology as genealogists dig through piles of facts to create a narrative of the past using geography. The facts can be fascinating! But how can genealogists place facts into historical context to grow research? How can information be shared? What kind of technology can be used to promote the family story to younger generations? The answers can be found with Google Maps! 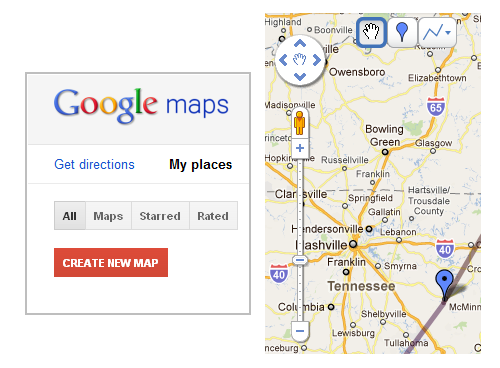 As a free component, Google Maps is available to all registered users of Google. In order to use Google Maps, create a username and password with Google and then select maps. This may also be accomplished by visiting the Google Maps. 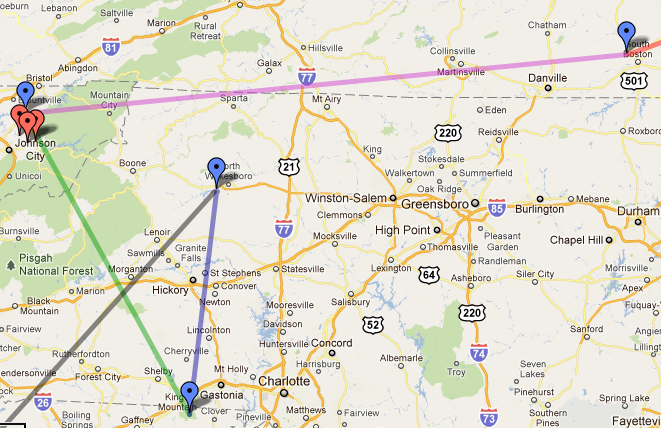 Google Maps allows researchers to highlight areas of interest by dropping pins on specific locations. Information, notes, or pictures may be attached to these pins. This is especially helpful to researchers trying to create a timeline for an ancestor or an ancestor's family. By dropping pins at various geographic points, genealogists can recreate a migration pattern and recreate the neighborhood that an ancestor lived in. The term neighborhood is used loosely as some did not live closely to other inhabitants of a given area. However, an ancestor lived, communicated with, and interacted with people who lived around them. Census records, deeds, church lists, probate records and other records all list names of people that came into contact with an ancestor. By geotagging known facts about an ancestor's and their neighbor's activities, researchers can begin to recreate an ancestor's neighborhood which can add historical and geographical context to a family's heritage while leading to other discoveries. Geotagging is an important concept for genealogy research. With geotagging genealogists use longitude and latitude coordinates to mark important geographic areas to document heritage. 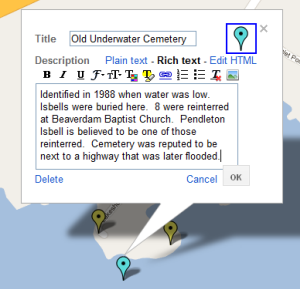 Cemeteries, headstones, historical markers, and land are all good objects for geotagging. Google Maps is just one website that offers geotagging specific points of interest. A mobile application for Google Maps is also available for those with a handheld device such as an iPhone or Android. Mobile apps are especially helpful in documenting precise coordinates and locations and are advantageous for genealogists on the go. When visiting heritage locations, a quick pin drop through an app can save information, photos, and notes for later. A great thing about Google Maps is that it is simple to use and there are not a lot of buttons to click or bells and whistles to remember. However, there are different features of Google Maps that will be useful to become familiar with. These are mainly the click and drag function noted by the hand icon, pins that are noted by a single pin icon, and lines which is represented by a lightning strike icon. After selecting edit, all three icons can be accessed at the top left of the map next to the zoom in and zoom out feature. To begin, select My Places to begin creating maps. Not only can a title be given for each map, but a description may also be added for further context. More than one map can be created given the different needs of the researcher. After a title and description has been added to a map, editing can begin. When in the Edit function, locations can be zoomed and different color pins may be dropped on specific locations where an ancestor was known to be at a specific time. Notes, citations, and photographs may also be added at this time. Each pin is accompanied by a note box. A box can contain whatever information is necessary or useful. This is a great opportunity to provide context. After the pin is dropped, click on the pin and the note box will appear. Then click on Rich Text and choose the appropriate icon for editing font, bullets, adding links, or adding pictures. Once pins have been dropped in specific locations, the Draw A Line or Draw A Shape feature may be chosen to drop lines or shapes from pin to pin. These lines and shapes can represent migration routes, property, or historical boundary changes. One interesting note about lines is that when a line is drawn from one pin to the next, Google Maps automatically calculates the miles between pins. It could be interesting to add up how many miles an ancestor traveled. One unique feature of Google Maps is to share maps with select individuals through email. By selecting Collaboration, genealogists can add as many people as they wish in order to view and edit a map. For those living at a distance this could prove extremely advantageous as each individual could provide details. The map can be used as a work in progress in order to recreate the environment ancestors lived in. Maps may also be shared through social media by making maps public and using the share feature. A link may be added or embedded into blogs or social networking sites. Another advantage is sharing family history with younger generations that are technology savvy. Whether through sharing the map outright or asking for assistance in creating one, Google Maps provides one more way to provide outreach to the next generation. Family history will provide interesting historical information that might also need to be documented. For example, Godfrey Isbell, and his brother Pendleton Isbell, lived in Pendleton District, South Carolina in 1790. Since that time a dam was built on a nearby lake causing the lands they lived on to flood. Homesteads and family cemeteries were destroyed. In order to narrow down the area that they lived, dates and names mentioned on deeds and other records were pinned on a Google Map. While the exact area they lived on is still unknown, facts from records and geographic knowledge of the area provided by a separate researcher allowed for excavation and recreation of Godfrey and Pendleton's neighborhood. It also provided a means to record some oral history as well as a personal account of the area through a research trip. As you can see from the clip, quite a bit of information can be noted! 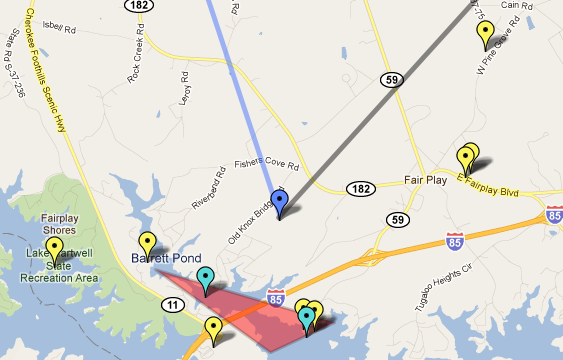 It should also be pointed out that a pin locates the old highway next to the underwater cemetery. The highway goes into the water and comes out on the other side of the lake. To further add some context to the map, pins were used to designate significant area markers such as a ferry, waterways, cemeteries, and memorials. Knowing through deeds that land owned by Godfrey Isbell was on Cane Creek, which is now flooded, gives support to an oral tradition that the land is now underwater along with the cemetery. Also, noting the land of neighbors and cemetery markers of people that Godfrey interacted with helped determine where his land could not be located. Shaded in by a geographic shape is the area that the ancestor probably lived.